The infamous Lucy Jane woke up this morning and wanted chocolate chip muffins. As a mother who never lets her children down (oh how I wish that were true), I indulged. We actually made them together and it was fun to be in the kitchen with my daughter making breakfast (or dessert, depending on your perspective). We decided to double the recipe so that we could freeze a dozen and use them for snacks in their lunches for the upcoming week. In a large bowl, whisk together flour, baking powder, baking soda, salt and chocolate chips. Set aside. In a medium bowl, mix together melted butter, sugar, eggs, buttermilk and vanilla. Mix the dry ingredients into the wet ingredients and gently fold together until combined. Scoop batter into a 12 cup muffin tin. Fill the cups close to the top. Bake the muffins at 425 for 5 minutes, then turn the heat down to 375 and bake for another 13-15 minutes. I consider myself a connoisseur of brownies. I have eaten hundreds of different kinds of brownies. I, of course, have a checklist of what I enjoy in a brownie and what makes an exceptional one! It has to be soft and chewy. It has to have that rich, fudgy, decadent flavor. Not to bitter and not to sweet. In my opinion, a brownie does not have to be frosted. If it is tasty enough to stand on its own, then let it! But if it is frosted, the frosting has to be good enough to not ruin the brownie. Okay, I’ll stop and just say that this brownie is ALL of these things. It is also easy to make. No fancy ingredients and no weird baking methods. Just a yummy brownie! And just for the record, these babies are good enough to stand on their own. So now it’s for you to decide: Frost or not to frost? In a stand alone mixer, combine butter and sugar. Then add eggs and mix until combined. Add vanilla, cocoa and salt and mix. Add flour and combine. Do not over mix. Pour batter into a 9×13 greased baking dish. Bake for 18-22 minutes, or until a toothpick inserted comes out almost clean. In a small saucepan, melt chocolate squares. In a stand alone mixer, cream the butter for about 4 minutes. Add melted chocolate, 4 cups powdered sugar and vanilla. Mix. Slowly add milk until the mixture begins to look like frosting. Then add one cup of powdered sugar at a time and adding milk to achieve the desired consistency. The trick to this frosting is to keep on whipping. Make sure all powdered sugar is blended before adding more. Cool brownies completely before frosting. Ok, to say that I have been obsessed with salted caramel over the past several months would be an understatement. I think about it, I dream about it, I want it all the time! I love the sweet taste of caramel with the distinct saltiness of sea salt at the end. I love the sweet and savory! I want it on cupcakes, custards, yogurts, milkshakes, breads, treats, you name it! 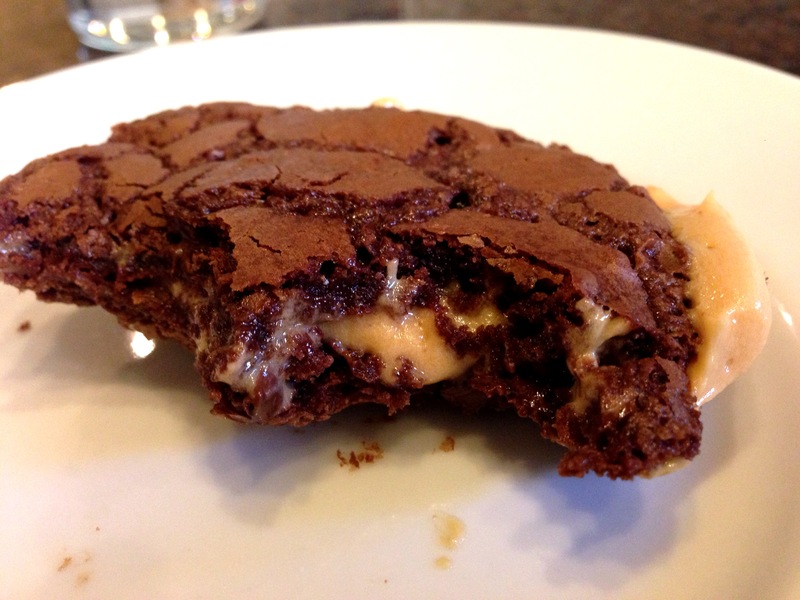 So, this cookie turned into a little salted caramel, chocolate, heaven on earth type dessert. 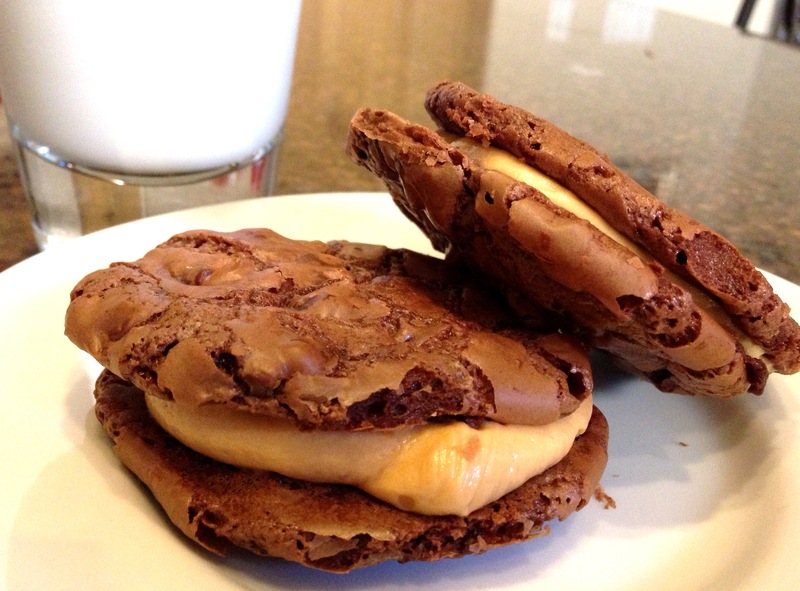 Chewy brownie cookies with a creamy, salted caramel filling, I could die right now and be just fine! It happens to be the best thing that I have tasted in a long time. I tested it out on my Dad and my husband and both said,”winner!” And since I am in such a giving mood, I want you to have it, too! Place butter in a saucepan over low heat and gently stir until melted. Add 7 ounces of chocolate and stir until smooth. Set aside to cool slightly. In a stand up mixer, combine, eggs, sugar and vanilla and beat for 15 minutes or until pale and creamy. (The extreme beating gives this cookie its great texture! So set your timer!) Add in flour, baking powder, melted chocolate mixture, remaining 5 ounces of chocolate and mix just to combine. (Don’t over mix.) Chill batter for 10 minutes. Dough should still be slightly gooey, but not watery. Spoon 2 tablespoonful of the mixture, onto parchment lined jelly roll pan. Bake for 8–10 minutes or until puffed and cracked. Allow to cool completely on pans before transferring to a wire rack. Place butter in a bowl and beat until fluffy., about 4 minutes. Mix in powdered sugar and salt, add in caramel and beat until smooth and creamy. Spread or pipe the frosting in between two cookies. Sandwich them together. 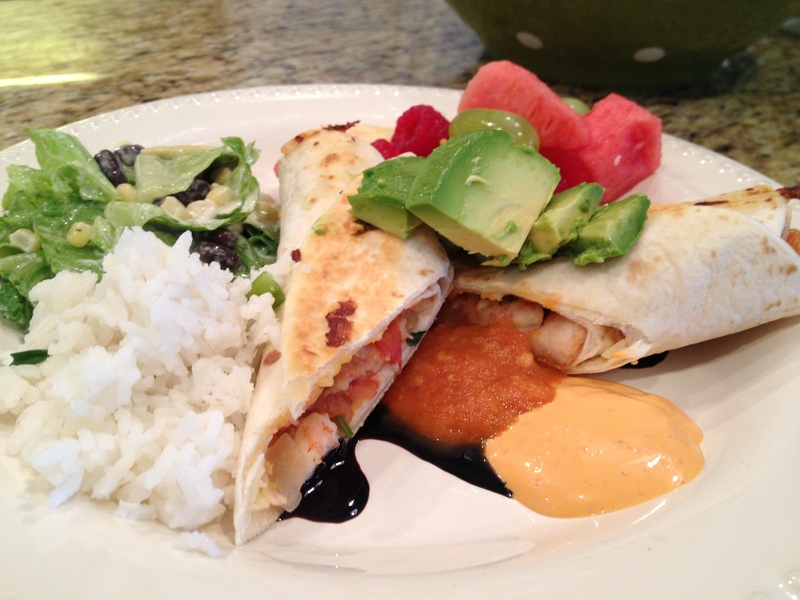 You are going to LOVE this yummy and versatile recipe. 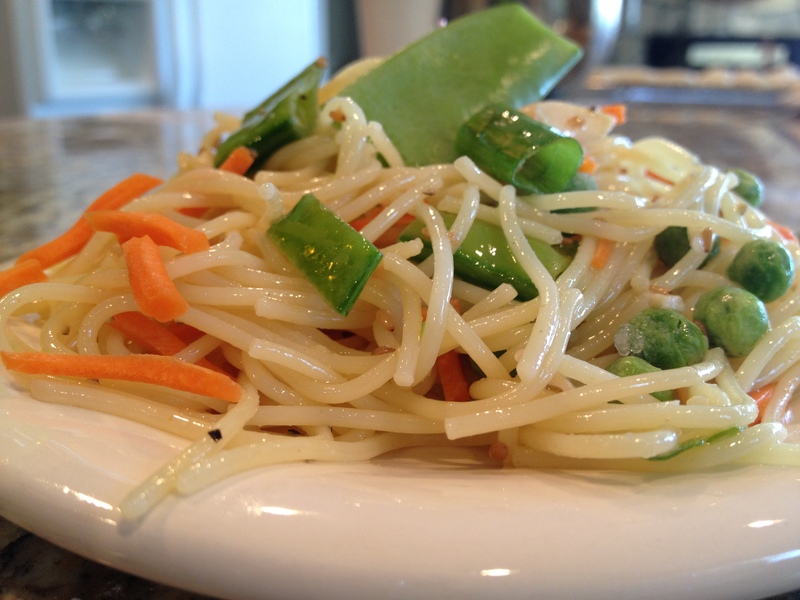 We make this as a side dish, or add a little grilled chicken or poached shrimp and turn it into a meal! We get mad raves on this easy to make salad… we’re sure you will too. 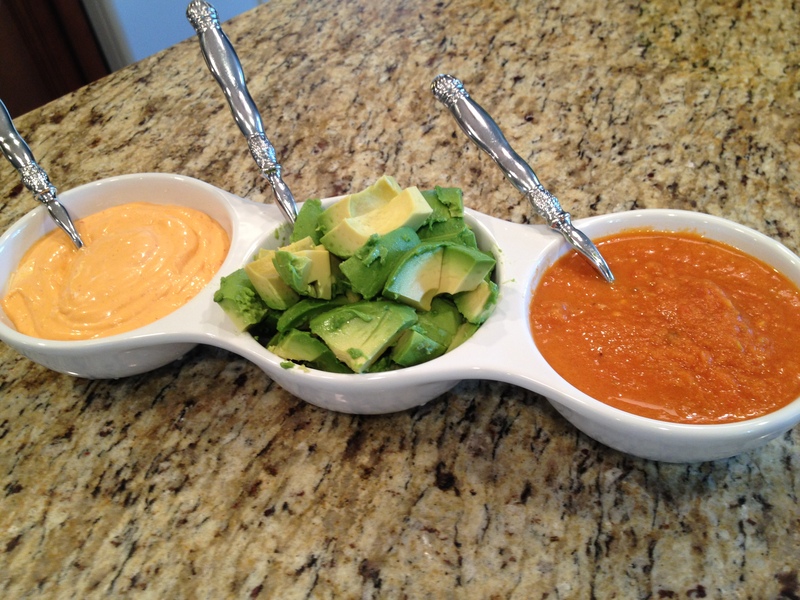 What makes it so easy is that we use this yummy bottled dressing. As we’ve said before, we love to make yummy food, and we love it when we can find a product that makes the job of preparing that yummy food easier. 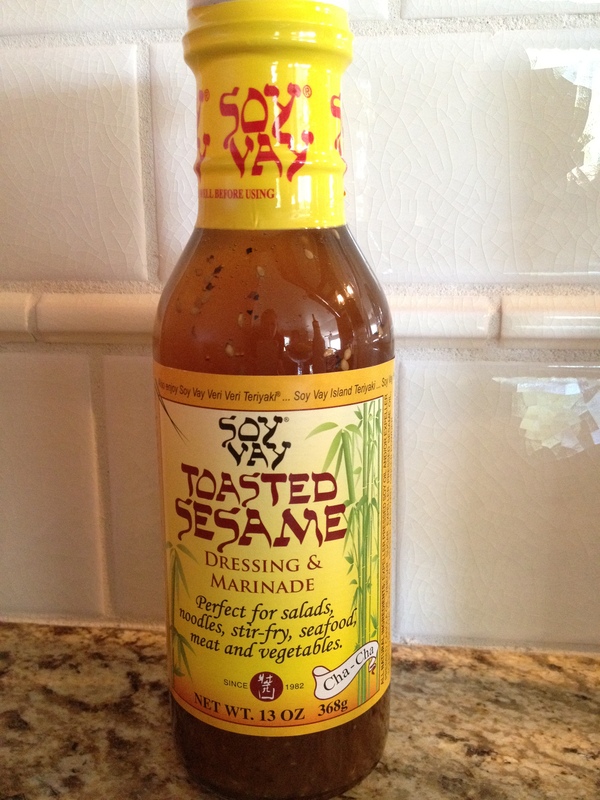 This is one of those products… Soy Vay Toasted Sesame Dressing and Marinade. It can be found in most grocery stores, in the salad dressing isle. I use about half the bottle on the salad and then throw the rest in a ziplock bag with some chicken breasts to marinate for grilling. In a large bowl, toss all the ingredients, and enjoy! Well, the school year has started again and so that means that HOT COOKIE MONDAY has started again as well. 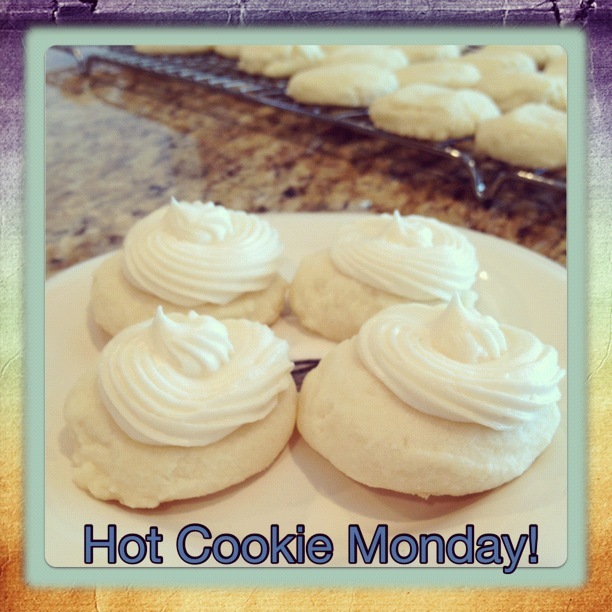 For those of you who are new to our little blog, “Hot Cookie Monday” is a tradition we came up with to help our families get through the dreaded first day of the work/school week. Here at Lucy Janes Best, we LOVE cookies! Every kind, every variety, every flavor! From simple to fancy, we love them all! Now we don’t know about all of you, but after a fun weekend spent doing whatever we want, Monday is quite the downer. So this tradition gives us something good to look forward to at the end of the day. Our families know that after school, right around 3:00, EVERY MONDAY, there will be hot, fresh, homemade cookies coming out of the oven. A good little pick me up, don’t you think? In fact, our tradition has become so well known around our circle of influence, that it’s not uncommon to get a few neighborhood drop in visitors. They all know to show up at 3:00 and cookies will be shared and enjoyed by all! So, if you start this tradition for your family, be sure to make a double batch every time… it doesn’t take long for the word to get out! Over the past year we’ve made lots of yummy cookies and shared the recipes for you to enjoy. Here’s the links so you can jump start your Hot Cookie Mondays: Brown Butter Oatmeal Chocolate Chip Cookies, Lemon Crinkles, Toasted Coconut Thumbprints with Salted Caramel Cookies, No Bake Cookies, Lemon Coconut Cookies, Robert’s Chocolate Cookies, Double Peanut Butter Blossoms, Gingerbread Boys, Cornstarch Cookies, Homemaade Oreos, Double Chocolate Peppermint Surprise Cookies, Rolo Cookies, Pumpkin Chcolate Chip Cookies, Perfect Peanut Butter Cookies, Monster Cookies, Brownie Cookies, Oatmeal Chocolate Chip Cookies, & Chocolate Crinkles! That ought to get you through to the new year and beyond, but don’t worry, we’ll keep posting our favorite cookie recipes, so you’ll have plenty to choose from. This week we made Stacey’s Meltaway Cookies. They are easy to make, to die for, deliciousness! When word got out that these were on the menu last Monday I had 5 drop ins… including one from Stacey herself! Nothing better than getting a few of your own favorite cookie without having to make them yourself, right? 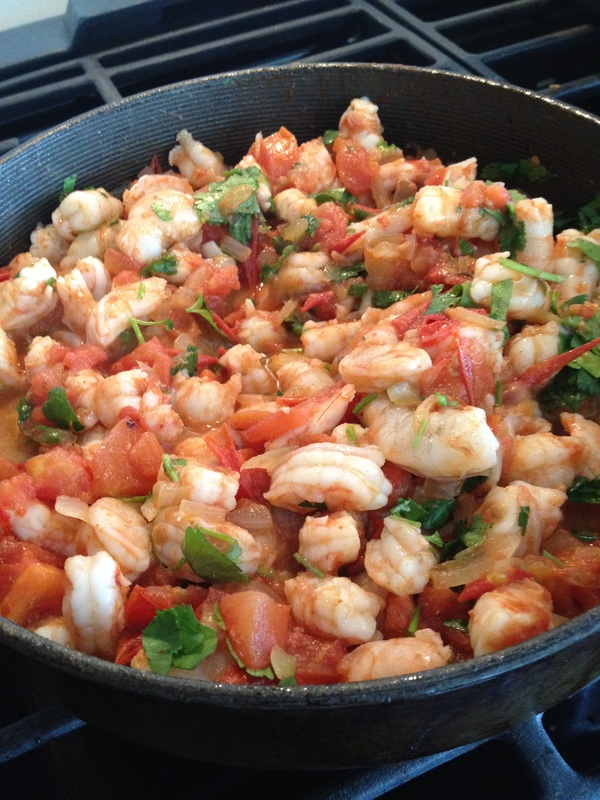 Thanks Stacey for this yummy recipe! In an electric mixer, mix all ingredients together until well combined. It will take a few minutes for the ingredients to come together; just turn the mixer on medium and let it work until everything is combined. Using a small cookie scoop, scoop the dough onto a parchment lined cookie sheet, then flatten each cookie slightly. Bake 10 minutes, cookies will not brown, do not over cook. Let cool 5 minutes on cookie sheet then transfer to a wire rack to cool completely. Frost and serve. In the bowl of an electric mixer, cream together butter and cream cheese. Add powdered sugar and mix to combine. Add vanilla and mix. Add milk until frosting reaches desired consistency. 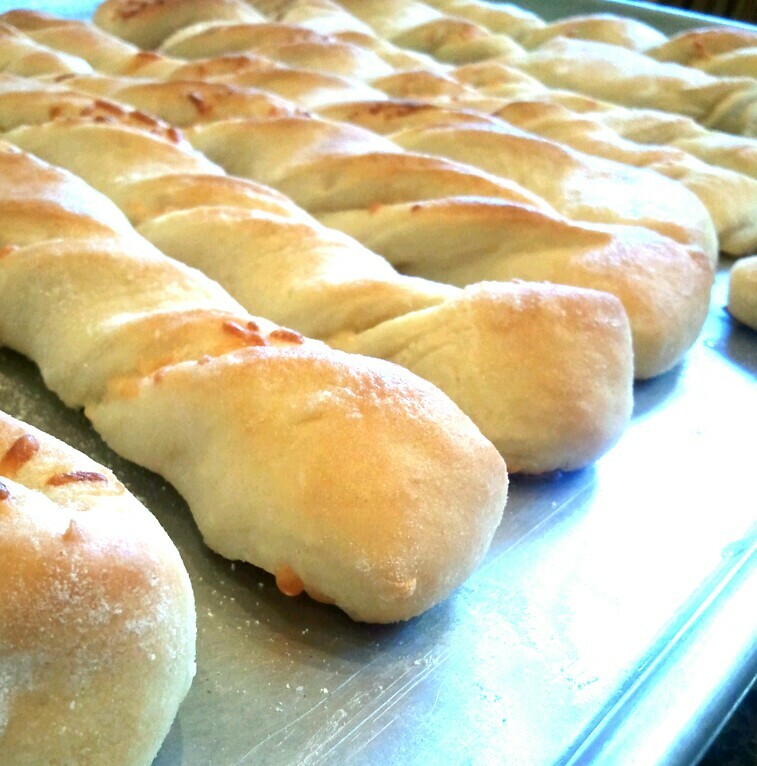 Sometimes you just need the goodness of a homemade breadstick. I felt that way last Sunday and wanted to make something to satisfy my craving. I used to believe that Sunday was a day of rest, but once I get baking and cooking, it becomes a day of food madness! But these babies were worth it! They don’t take long and they are easy to make. You can have hot, buttery, parmesan breadsticks in one hour! In a small bowl mix the water, yeast and sugar together and let sit for 10 minutes. In the bowl of your mixer add the flour and salt and mix. Pour the yeast water to the bowl and using the dough hook mix for a couple minutes until smooth. Let the dough rise for 15 minutes. Roll out the dough on a floured surface into a large square. Brush the top with melted butter then sprinkle with the parmesan cheese. Fold the dough in half and cut into 15 to 20 strips. Twist each strip and place on an ungreased cookie sheet. Let the twists sit for another 15 minutes to rise. Bake the breadsticks for 15 to 20 minutes or until golden brown. When they come out of the oven, brush the top with remaining butter.